Deleting a Talkgroup removes the Talkgroup from all WAVE clients. If the Talkgroup is associated with a radio system, Radio Subscribers will continue to function as normal but all audio with Broadband clients will terminate over the deleted Talkgroup. Talkgroups typically vanish from WAVE clients within a few minutes. 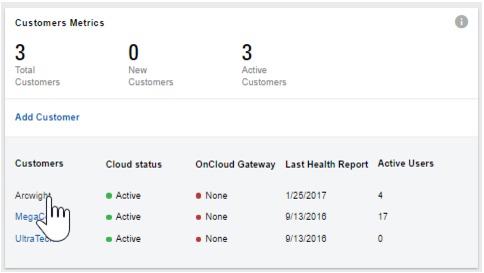 If you are a Partner or Partner Employee then click Customer and then the name of the Customer to edit. Note: If you signed in as an Employee then you are already in the Customer screen. Proceed to the next step. 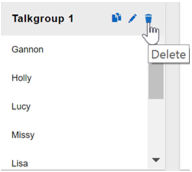 Mouse-over the Talkgroup to delete and then click the Delete icon. The Talkgroup is removed from the Talkgroups page and deleted.